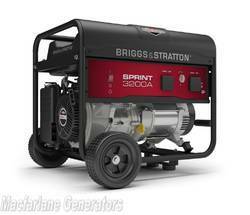 This Briggs & Stratton 3.2kVA Generator is built for easy manoeuvrability, with collapsible handles and never flat wheels. It's also built for strength and rigidity. A weld free tube frame makes for a stronger structure and high tension rubber engine mounts reduces vibration. It's also got a durable steel fuel tank with a fuel gauge. A Power Surge Alternator procudes a short surge of power needed to start large motor-driven appliances and tools simultaneously - with a pull start. It's also got two IP44 water resistant sockets with 12V/5A auxiliary power outlet. An Automatic Voltage Regulation limits the variation of the voltage of your generator +/- 2% to keep your equipment running smoothly and safely. This set comes with a 2 year manufacturer's warranty.